There are lots of books on the market about eldercare. Why should I buy this one? Advice and experience from healthcare professionals & caregivers. Discussions of the emotional side of caregiving. Suggestions for talking about difficult topics. Information to find the best services right where your parent lives. Financial, legal, housing and insurance tips. Plenty of weblinks and referrals. A Parent With Whom You Have An Unsettled Relationship. Open Book Communications, 2008. 196 pgs. $24.95. 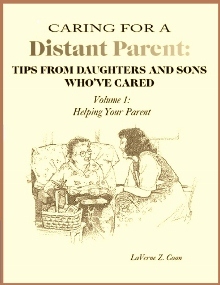 ...an excellent combination of extremely practical advice and emotional support for all children of aging parents, with a special resonance for those who live far from their relatives...I want you to know how much we appreciate your work and the materials and guidance. We have shared your books with many people. Thank you. CARING FOR A DISTANT PARENT will be your constant reference for eldercare resources and personal issues. It's a Reference Book. You don't need to read it all at once. Look up a topic, read the short article, and move forward to care. The book emphasizes Balance. Care for your elderly parents and take care of YOU! 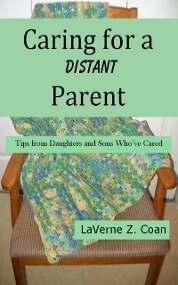 It was written by a Caregiver Like You.